I decided to start this post with an amazing photo and also a memory to go along with it…All because it would be a crime if I didn’t tell you why I decided to post this recipe for The Easy Vegan Blog Tour! It all started on Thanksgiving week in 2013. My family and I were visiting my sister in-law at her new house and celebrating the holiday. Being the typical vegans exploring a new territory, my husband and I decided to rent a minivan for the duration of our trip and take the kids with us to explore during the day to all the historic sites in Boston and plan EVERYTHING around the vegan/vegan friendly restaurants that the city had to offer. One place in particular was an all vegan restaurant called Root (which sadly closed its doors recently). While there, we must have ordered a little bit of everything on the menu. One item that stood out was their Cauliflower Po’ Boy which was their special of the day. After having that sandwich, it was all I could think about until we went next door to FoMu for dessert. Needless to say that night had my family and I in a MAJOR food coma. My in-laws sadly stayed at home during this time (in their defense, there was an illness going around that week too!) but I know if they did join us, they would have been in heaven too! After our time in Boston was done, the first thing I did when we got back home to Charlottesville, VA was to recreate the Cauliflower Po’ Boy. The results were ok but the spices and the sauce were a bit off. I used the leftover breading/batter and made some fried green tomatoes! Fast forward to a couple of months ago when I was given a copy of The Easy Vegan Cookbook to review and noticed a Cauliflower Po’ Boy recipe. In comparison to the one I tried to make myself, this version was baked (making it a bit more figure friendly!) and the sauce recipe was pretty straight forward and not a bunch of guess work. Long story short…The spices were spot-on to the sandwich I remembered at Root restaurant and the sauce was to die for! I didn’t even notice the cauliflower wasn’t fried! So without any further delay….Here’s the recipe that took my family down memory lane! 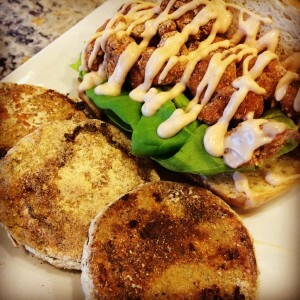 French fry po’ boy, why not one made of cauliflower? Please note that the cauliflower will be bone dry after it’s roasted, so it will need to be “dressed” in some kind of saucy condiment. 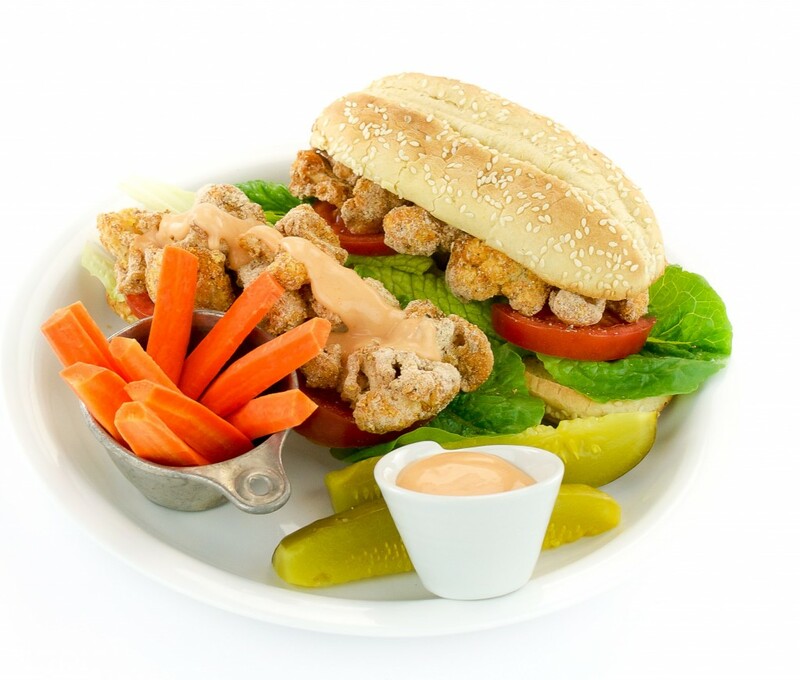 In New Orleans, if you order a sandwich “dressed,” that means you want mayo, lettuce and tomato. minutes, turning every 10 minutes. Cook until the cauliflower is tender and is easily pierced with a fork. So far in this book I have made: DIY Golden Creamy Gravy, DIY Cajun Seasoning Blend, Maple Walnut Sausage Patties, Creamy Cauliflower Pesto Pasta, Apple-Braised Tempeh and Butternut Squash Bake, Apple Zucchini Buckwheat Pancakes, All Natural Carrot Dogs, Veggie Quinoa Drop Biscuits, Dreamy Greens, and My Favorite Maple Walnut Brownies. The best part is that I barely cracked the surface of this book and all the recipes are truly easy to throw together! Which leads me to the next topic…. 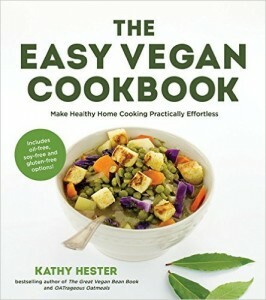 Yes you heard that right…You can have your own copy of The Easy Vegan Cookbook by Kathy Hester! Just follow the instructions and a winner will be selected in two weeks. This giveaway is only good for those who live in the US and Canada. This entry was posted in Uncategorized and tagged cookbook, Giveaway, Review by Robin. Bookmark the permalink. 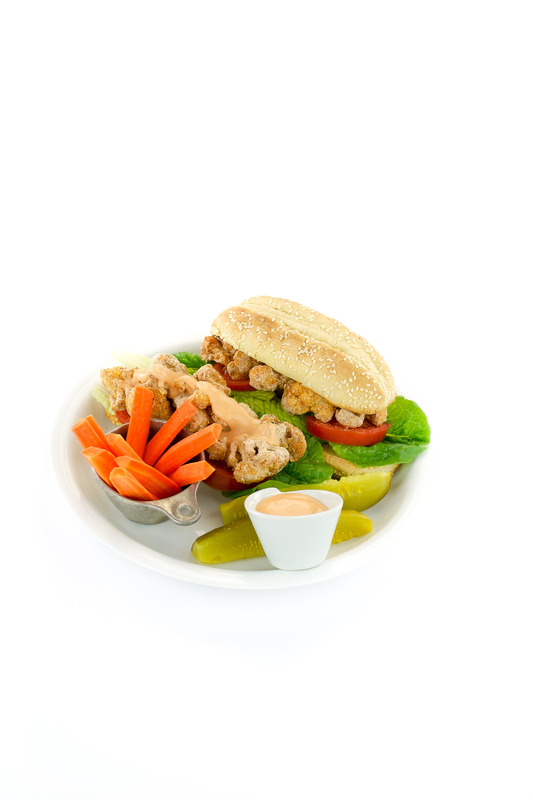 Thank you so much for being on my book blog tour – I am thrilled that you like the po’boy recipe! !